In my last guest article I took a look at Aspen Faith, a wrestler who you should keep an eye out for. 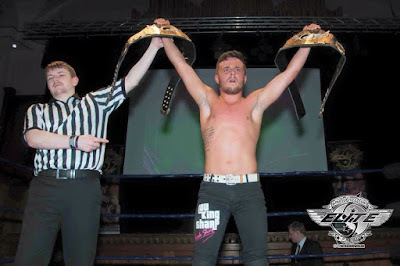 Well this time I want to do the same again and highlight another young performer that you should know as he's your Mother's favourite wrestler. That man is Lou King Sharp. He's (in his own words) "relevance, intelligence, elegance and beauty" plus "ripped and jacked". Lou King Sharp is a product of the PBW Academy. Coming to the ring with the fitting Fix Up, Look Sharp by Dizzee Rascal playing, this charismatic young man can be the cocky loudmouth or the cheeky scamp who likes to just have fun and entertain. 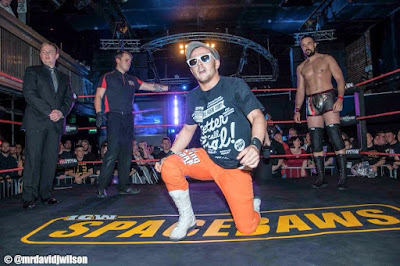 Having become a staple in Scottish wrestling over the last year, Sharp provides a confident demeanour who relishes proving people wrong when they see him enter. 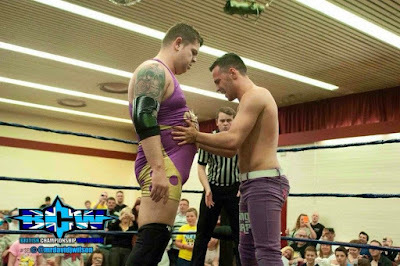 Never one to shy away from a challenge, or to have someone bully him, Sharp came up on many peoples radar after confronting one of the most violent wrestlers in Scotland, Chris Renfrew. After a brutal match at ICW Spacebaws, he may've left with a loss but he'd earned everyone's, including Renfrew's, respect. Proving that size doesn't matter, Sharp held the Pro Wrestling Elite Tag Team Championships on his own after defeating The New Age Kliq (with some help from Lionheart) defending it against all comers with guest tag team partners Lionheart (as Lion King) and Kris Travis before teaming with Joe Hendry and having his luck run out against Fight Club (Kid Fite and Liam Thomson). Whether he is teaming with his "adopted father" Joe Hendry in Discovery Wrestling, his GTA brother Donnie T in PBW or as part of Chris Toal's Family in ICW or even on his own in WrestleZone, Pride Wrestling and Rock N Wrestle to name a few promotions, Lou King Sharp is fast becoming someone that relied upon to put on a match of the night performance against anyone, anytime, any place. The first time that I had saw Lou King Sharp, I was captured by his commanding presence on the microphone. His ability to play the crowd to either support the underdog or enjoy the beating he's receiving is outstanding. He joins a long list of stand outs that have came from the PBW Academy like Kenny Williams, who may be featured in a future article. I've been able to see him be the bad guy and the fan favourite, tweaking his character to suit. Another one that is the total package, he will be on a show near you soon. Lou King Sharp is not only Your Mother's Favourite Wrestler, he's also one of mine.